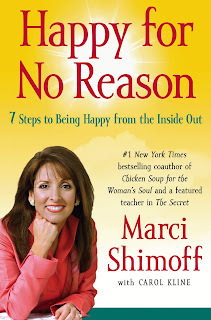 Marci Shimoff is the woman's face of the biggest self-help book phenomenon in history, Chicken Soup for the Soul. Her six bestselling titles in the series, including Chicken Soup for the Woman’s Soul and Chicken Soup for the Mother’s Soul, have met with stunning success, selling more than 13 million copies worldwide in 33 languages and have been on the New York Times bestseller list for a total of 108 weeks. Marci is one of the bestselling female nonfiction authors of all time. In addition, she’s a featured teacher in the international film and book phenomenon, The Secret. Her new book, HAPPY FOR NO REASON: 7 Steps to Being Happy from the Inside Out, offers a revolutionary approach to experiencing deep and lasting happiness. 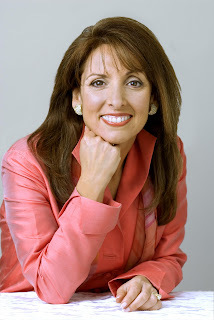 A celebrated transformational leader and one of the nation's leading experts on happiness, success, and the law of attraction, Marci has inspired millions of people around the world, sharing her breakthrough methods for personal fulfillment and professional success. President and co-founder of the Esteem Group, she delivers keynote addresses and seminars on self-esteem, self-empowerment, and peak performance to corporations, professional and non-profit organizations, and women's associations. She has been a top-rated trainer for numerous Fortune 500 companies, including AT&T, General Motors, Sears, Kaiser Permanente, and Bristol-Myers Squibb. Through her books and her presentations, Marci's message has touched the hearts and rekindled the spirits of millions of people throughout the world. She is dedicated to fulfilling her life’s purpose of helping people live more empowered and joy-filled lives. What would it take to make you happy? A fulfilling career, a big bank account, or the perfect mate? What if it didn't take anything to make you happy? What if you could experience happiness from the inside out - no matter what's going on in your life? 7 Steps to Being Happy from the Inside Out, transformational expert Marci Shimoff offers a breakthrough approach to being happy, one that doesn't depend on achievements, goals, money, relationships, or anything else "out there." Most books on happiness tell you to find the things that make you happy and do more of them. Based on cutting-edge research and knowledge from the world's leading experts in the fields of positive psychology and neurophysiology, plus interviews with 100 truly happy people, this life-changing book provides a powerful, proven 7-step program that will enable you to be happier right now - no matter where you start. Studies show that each of us has a "happiness set-point" - a fixed range of happiness we tend to return to throughout our life - that's approximately 50 percent genetic and 50 percent learned. In the same way you'd crank up the thermostat to get comfortable on a chilly day, you can actually raise your happiness set-point! The holistic 7-step program at the heart of Happy for No Reason encompasses Happiness Habits for all areas of life: personal power, mind, heart, body, soul, purpose, and relationships. WOW! That's my first descriptive word. I'm serious. Please don't think I'm just saying this! In one earlier post, I wrote about how negative I think. I honestly do, and always have. Through reading this book, I'm learning how to change my thinking. Thoughts are a MAJOR part of how we live our lives! I always thought I was born this way, and the book has taught me that some of the way I think is genetic, but I can CHANGE the way I think. I'm almost done the book (I haven't finished it yet!) but I have learned so much from it already. And I want two of you to win a copy of this life-changing book as well! To win, Fill out the form. That's it. I'm keeping this one simple - just tell me why you'd like to win this book and you're entered! Be sure to stop by Moody Mama Says and Everyday Baby Steps and enter their giveaways! Leave a comment here with the giveaway you entered!